Great opportunity to be part of the Regional and National Cyclo Cross Champs at Cyclopark. Would you like to be part of helping make 2 major Cyclo Cross Events at Cyclopark come alive? If you are then we would like to talk to you. 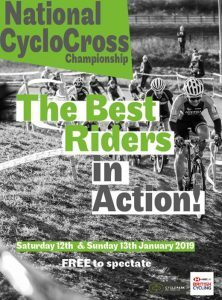 We are looking for volunteers from riders, clubs and supporters of Cyclo Cross to help marshal and maintain the course for the Regional and National Champs. Anyone who is available to help on the 1st – 2nd December or 12-13th January should contact Cyclopark Events Manager Kyle Borley (Kyle.Borley@cyclopark.com), or can liaise with the BC Regional Events Officer, Phil Webber PhilWebber@britishcycling.org.uk for further info. Volunteers will be looked after well with a packed lunch & a voucher towards refreshments in the ParkEat café. The 2018 Regional Championships will be making a welcome return to Cyclopark – one of the South East’s major cycling venues. Cyclopark feels very privileged to be hosting this event on the build up to the National Championships. 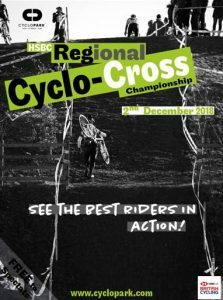 We are expecting a high quality field in all races throughout the day with many of the top riders in the region eager to test themselves on what will be a perfect trial run for the National Championships course. The Regional course will have a few hidden gems which will not be included on the National course which will give the Regional riders that unique experience. Cyclopark is very excited to have Cyclo-Cross racing back at the venue after the success of last year’s National Trophy Series and we look forward to seeing some of the regions riders back here. We would like to wish all the riders the best of luck.